Happy 3rd birthday to Isabella! Yesterday Crown Princess Mary was seen in Hobart having lunch and doing some selective shopping with sisters Jane and Trish and friends. Today Mary left Hobart and flew to Melbourne for a connecting flight to Adelaide, where she was driven to friend Amber Petty's apartment, arriving around 1pm. Reported plans include a reunion of shared friends from Sydney for Amber Petty's 40th birthday party. Happily Mary does appear to have enjoyed a quiet and private (at least from us) day in Hobart on Wednesday, with just a photo glimpse of her farewelling visitors at sister Jane's house during the morning. There have been short items on commercial evening news programmes this evening about Mary's departure from Hobart and arrival in Adelaide which have not been posted on media websites - maybe the last day of the Australian election campaign has something to do with that. B.T. is carrying a story that Australians are 'surly' about Mary's visit based on comments posted on newspaper websites (you can read them from the links to stories here if it takes your fancy). B.T. quotes some of the comments. Fortunately the sometimes bizarre ramblings of many of these posted comments are not representative of most Australian's view of Crown Princess Mary based on evidence elsewhere and certainly in this blog's experience. On the other hand, Billed Bladet reports that people who have encountered Mary on aircraft and local Australian media generally are remarking on the lack of a 'baby bump'. A midwife is quoted explaining that Mary's muscle fitness and height explains why the pregnancy is not yet very visible (based on a story in Se og HØR). Se og HØR writes of the privacy laws in Tasmania which prevented the press from being as invasive as they have been on previous visits (the amended law was introduced last year primarily to deal with people filming children in playgrounds and other public places and using the material inappropriately). It writes passengers noticed the Danish Crown Princess, who sat and read a Danish book, and travelled with a Danish bodyguard. One older female passenger is quoted saying, "She seemed like a totally normal woman. She looked beautiful, but I didn't see a baby bump." The latest from The Adelaide Advertiser is that Mary was greeted by Amber Petty at her apartment building, while her security detail checked in at an adjacent boutique hotel. According to this report the 40th birthday celebration for Amber will be black tie tomorrow night (Saturday local time). 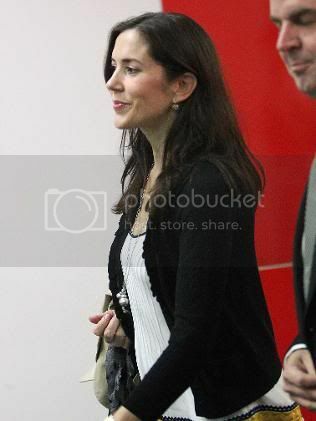 The Adelaide Advertiser - First pic of Princess Mary's arrival in Adelaide (updated). Maybe it doesn't fit? To all those people who haven't been pregnant, your fingers do swell up. She is carrying two children!! I noticed it and then thought about the swelling - I guess we'll see if she wears them when she gets back to Denmark. Maybe she didn't travel with them?